Yes, TokoBobo is a weird name, so you know the story behind it has to be good, right? Here it is! My husband and I do not call each other names, even if we happen to be "discussing an issue with vigor". One day, being particularly exasperated by me, he said "Stop acting like such a . . . . a . . . TokoBobo!" It was his way of saying that my "personality traits" were a little on the challenging side at that moment. OH MY! He was RIGHT! So right, in fact, that we both cracked up laughing at the sheer genius at using that combo which became my nickname. Now, the question is who are these people and why do they affect others this way? 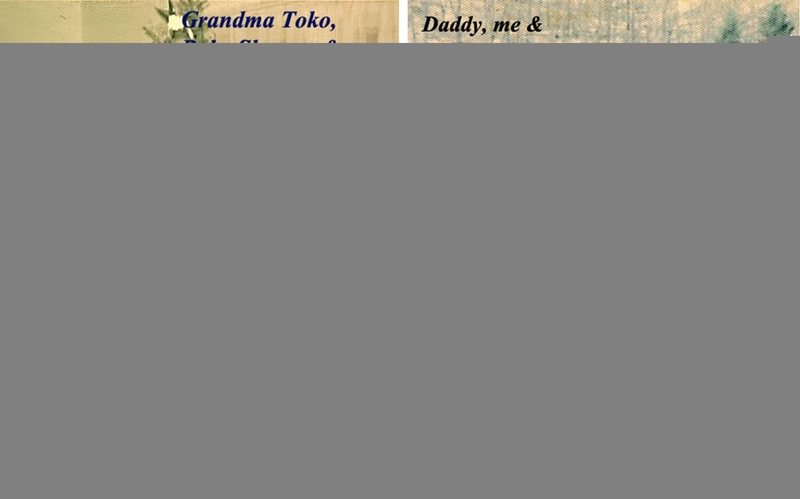 Toko ~ Mae Toko to be exact was my grandmother. A formidable creature with the elegance, grace, dignity and Southern refinement that could make royalty pause. But don't mess with her. She had the ability to freeze water with a single glance and would use that skill without notice if you stepped out of line or grace in a given circumstance. Who needed Emily Post when that lady was about? She made you desire her approval and when received, it was more bankable than an Oscar. She had a strength that was born of being a pioneer in her day, but these things she didn't talk about much. Talking about those things with a general audience would have been ill-bred. Only in the quiet intimacy of our grandmother/granddaughter moments did she share her struggles. . . . and her subsequent triumphs. To be "unsmitten" by her was not an option. Trust me. She is the part of me that connects with grace, beauty, gentleness, refinement and unabashed joy in this world. Bobo ~ Oh dear. This was my father's nickname. He was the eldest of the aforementioned Toko. He was the most lovable, gracious, dignified "outlaw-type" you would have had the pleasure to meet. Conformity wasn't even on his radar. He didn't understand it really. He never tried to be a rebel . . . he just WAS one. The idea that you might change who you are to be like a lot of other people and make them comfortable just didn't compute with him at all. In rejecting that notion, he came across as quite a formidable creature. He had the ability to light you on fire with a single glance and would use that skill without notice if you stepped out of line or grace in a given circumstance. His travels and experience would have made a wonderful movie, but he only shared the more humorous excerpts with the general public. It was only during the quiet moments of our father/daughter time that I heard about his struggles . . . . and his subsequent triumphs. To be able to resist his charisma was impossible. Everyone loved Bobo. Even at his most exasperating! Sound familiar? He is the part of me that unapologetically leaps outside the box that "they" created for the sake of truth and expression. Those two, in so many ways, could not have been at greater polarities. Which made the fact that they were so much alike quite comical. When they were in the same room, it was better than watching cartoons as a kid! The fact that my genetic make-up took a direct hit from them is both exciting and scary! It is that juxtaposition that is one of the cornerstones of my personality and subsequently my art. It is why I chose the yin yang symbol. It is what partially defines my artistic expression. Things that really, at first glance, do not go together yet somehow creating a symphony and making you look . . . twice. Yes. This is me acting like a . . . . a . . . . TokoBobo!